Frequently asked questions from aspiring Certified Public Accountants -- with answers! Stephanie grew up studied at the University of Chicago in the US where she got her bachelor degree (Phi Beta Kappa) in Economics and Public Policy Studies. She began her career in investment banking in New York City and subsequently worked for Fortune 500 companies and multinational corporations in their corporate finance and strategic planning departments. Stephanie is a CPA but not in public practice. In January 2010 she launched IPassTheCPAExam.com to help aspiring CPA exam candidates plan, study for and pass the exam on their first attempt. 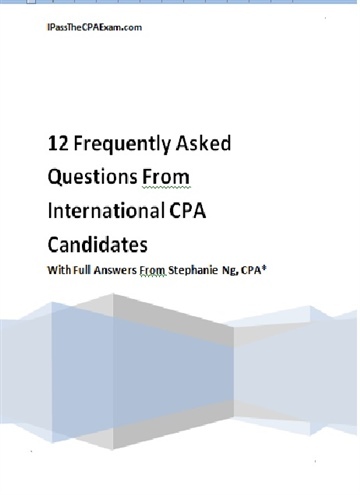 After helping thousands of candidates to achieve their goals, she wrote a book in 2013 for international candidates on how to get qualified for the CPA exam, together with study plans, tips on how to work on multiple-choice questions, simulations and written communication tasks, and specific exam-taking strategies.